This is one of our first designs from our very popular Felt Series. 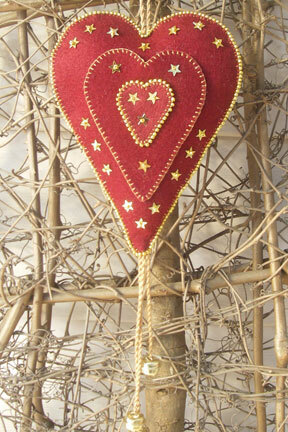 The Felt Christmas Decorations have been designed so they can hang either way - there is no back or front. This kit has everything you need to complete a Felt Christmas Decoration and the patterns have very detailed instructions to ensure completion. The size of a decoration is 6 1/4" x 5 1/4" (16cm x 13.5cm). Mini Kits.... Includes your pattern and all the fabrics, materials and notions needed to complete your project. There are no 'patterns only' available for these designs. The kits are available in red/gold or white/silver as shown in the photos.